Long-term success of our conservation efforts depends on close connections between people and the lands themselves. Studies indicate a growing phenomenon, Nature-deficit disorder. Not a medical diagnosis, it’s a condition suffered today by many youth – and likely adults, too. Research links the lack of chances for children to play in nature with reduced use of their senses, attention difficulties, obesity, and higher rates of emotional and physical illnesses. Research also shows that environment-based teaching leads to higher student achievement. Our goal is to establish a preserve close to the Olympia-Lacey area, where kids can learn and play. We have a unique opportunity to protect an amazing, diverse 100-acre landscape of natural habitat with a mile of Puget Sound shoreline. The land – with established second-growth forest, extensive marine shoreline, wetlands, unique tidal lagoon, an historic homestead and orchard – is home to ancient Native American shellfish middens, and a rich history connected to the surrounding community. This will be the home of the Inspiring Kids Preserve, to serve Thurston County schools and families as a vast area for students to learn from nature through hands-on activities, and for families and their kids to refresh themselves and explore. With the help of our supporters and partners, we are making it all happen! Collaboration is a core value for Capitol Land Trust. 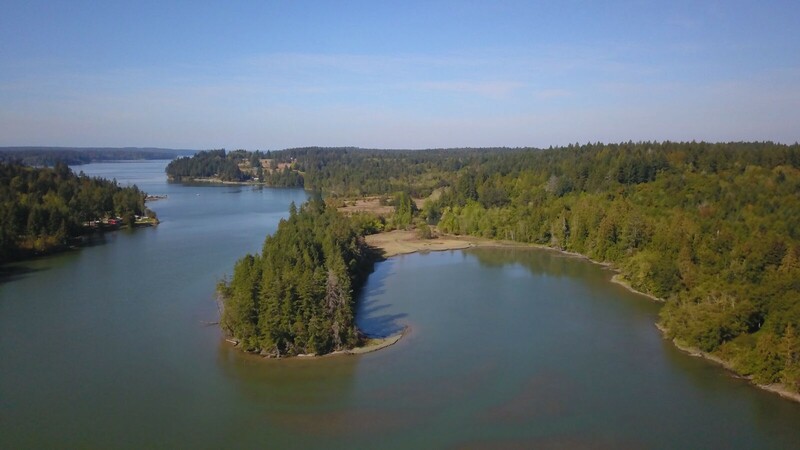 In Phase I, our partners include the Squaxin Island Tribe, The Trust for Public Land, Taylor Shellfish Farms, WA’s Department of Ecology and Recreation & Conservation Office, Puget Sound Partnership and Thurston County. For Phase II we are seeking partnerships with youth and student organizations. These include the Hands On Children’s Museum, Pacific Education Institute, Thurston County area schools, and Thurston Conservation District’s South Sound Green, among others. We want to ensure that all kids, no matter their background, can experience all that the preserve has to offer. The two adjacent properties Capitol Land Trust acquired for the Inspiring Kids Preserve are on Henderson Inlet in south Puget Sound, near local schools and cities. Conservation of the 108 acres of complex habitat protect Puget Sound water quality and habitat for sea life, mammals and creatures in the uplands and thousands of migrating birds; as well as the deep cultural history of this place. As we enhance the property to make it more accessible for visitors, we’ll create activities for play and education – taking into consideration the unique ecological and cultural attributes of the land. We’ll work with schools to develop programs that meet STEM and Common Core standards. Students will learn Washington South Sound history; study effects of active forest management, marine and wetland restoration and human interaction with the land; and conduct grade-appropriate science to learn about ecological systems in a natural setting. We will also reach out to community organizations who work with youth beyond the context of environmental education to see how access to the preserve can support their programming.